Compounding on top of the other problems already existing was the kickstand. 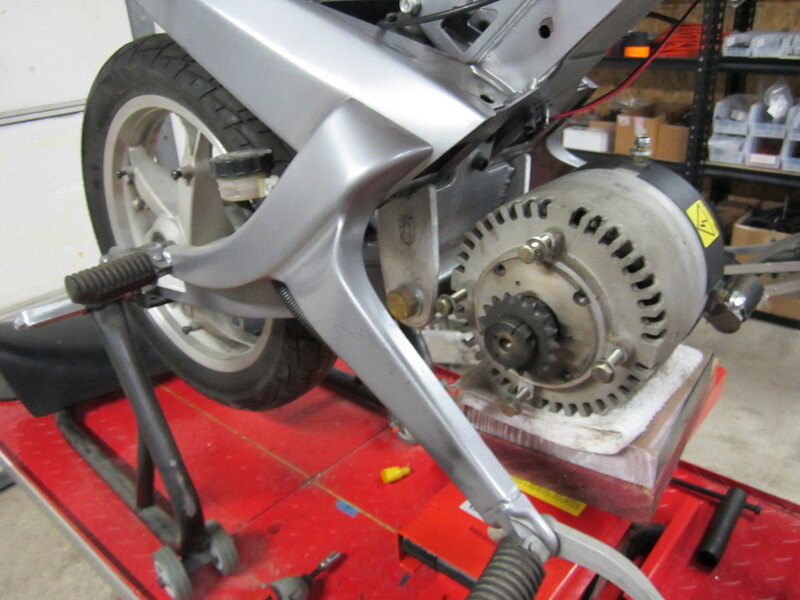 The previous kickstand for the Buell Blast was mounted on the left side of the engine. 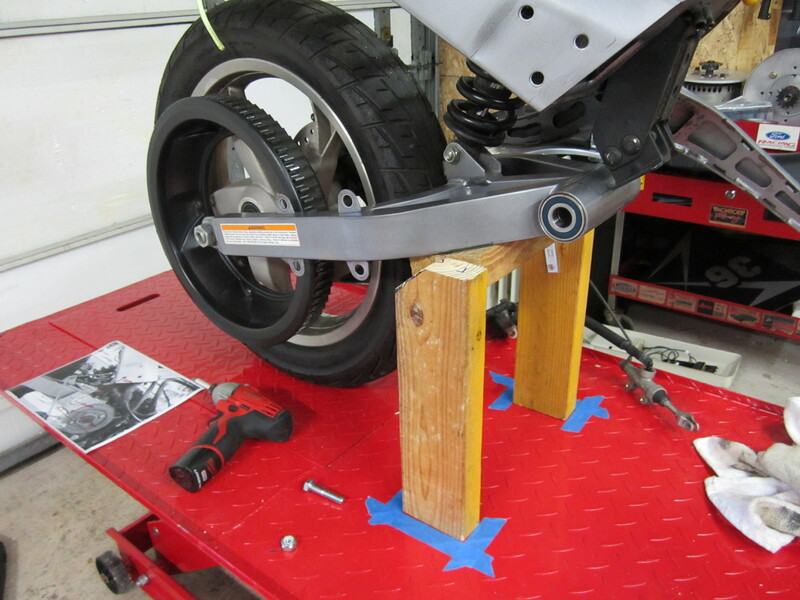 So now I had to devise a way to mount a new kickstand on the bike. As I expected the kickstand would not be long enough. I simply found another piece of square aluminum to fit over the kickstand after cutting off the “foot”. I then drilled a hole and installed a bolt to keep it in place. 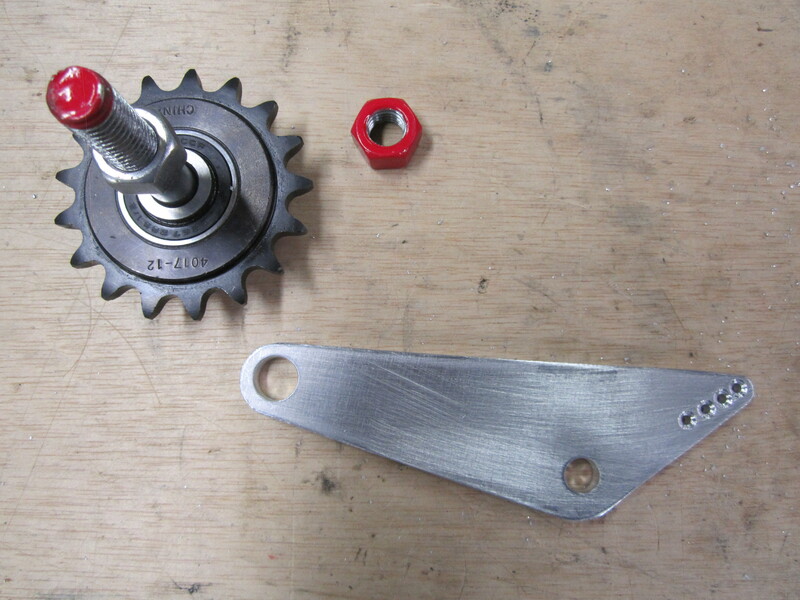 I traced the Zero kickstand flange on the Aluminum motor mount (which is very sturdy) to mark holes and drill for bolts. I then slightly tipped the bike to get an idea of how long the stand should be, then trimmed at an angle the square aluminum. After the kickstand was completed and working, I realized it was next to impossible to get down with my foot while sitting on the bike. 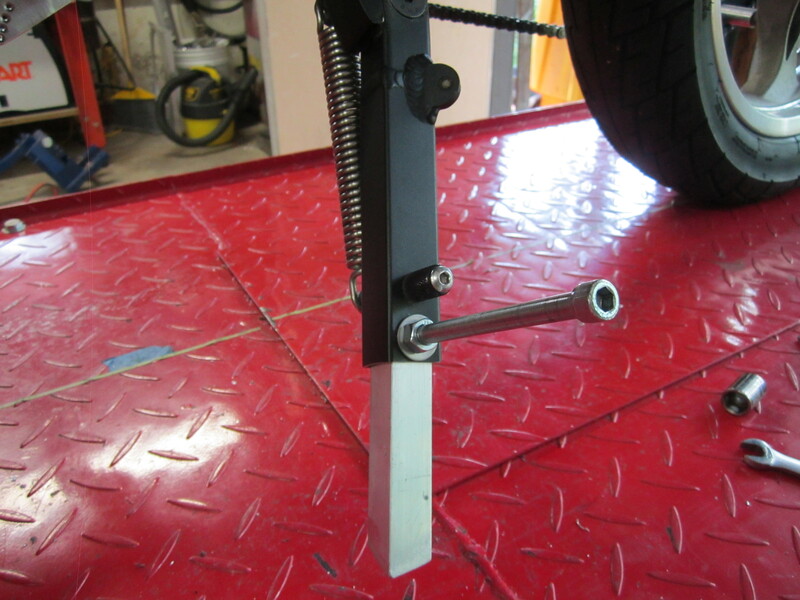 I installed a very long 4.5″ cap-head-bolt with aluminum sleve so my foot can properly actuate the kickstand. I then welded a pad on the bottom and painted the whole thing silver to match. The kickstand works flawlessly! Although this looks difficult, it really is not. 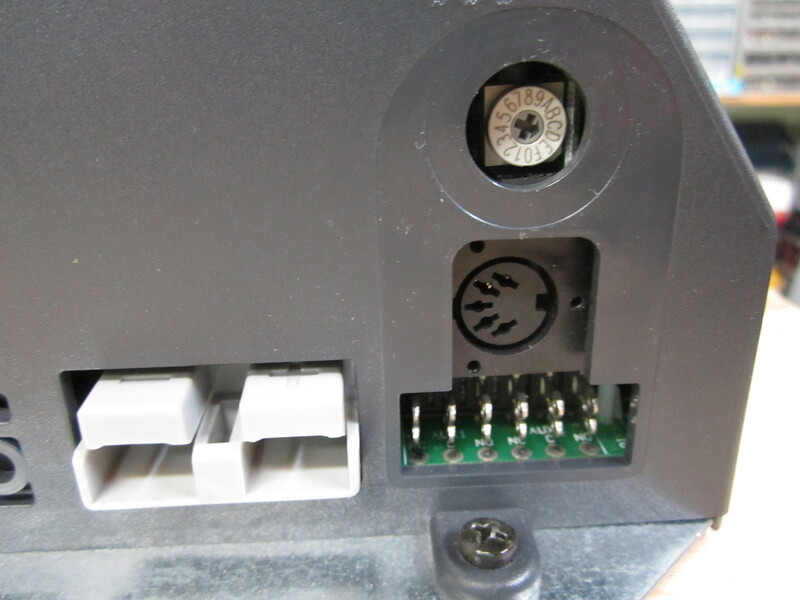 This battery mount is simple because its only holding 2 battery modules. 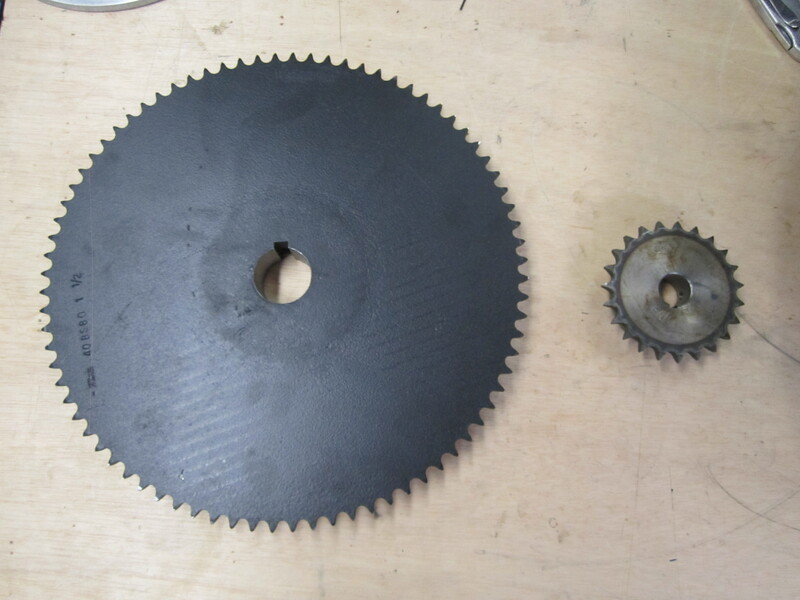 It was constructed using 1″ 6061 aluminum 90 degree angle, and 1.25″ 6061 flat stock from http://www.speedymetals.com. 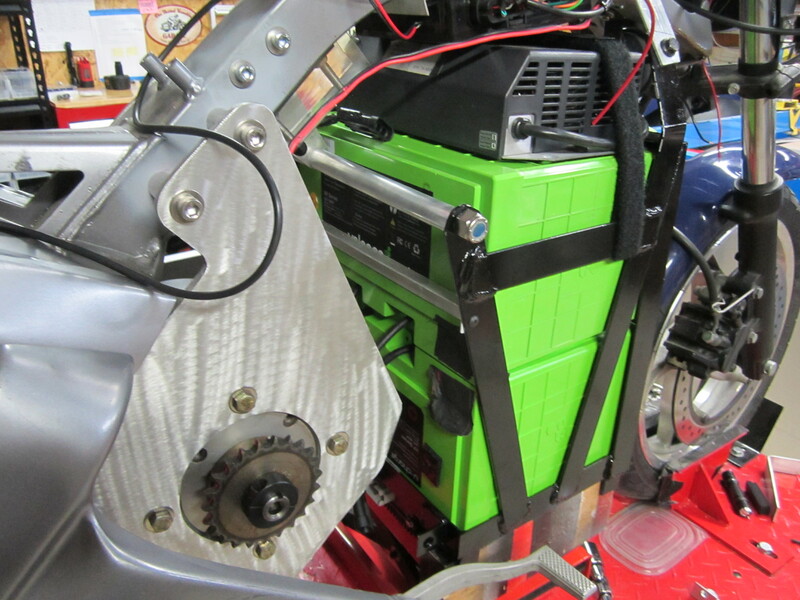 pre-assembled the battery pack and jacked it into place using a motorcycle/atv jack from Harbor Freight. This allowed me to put the battery exactly where I wanted it and fab up the mounts. 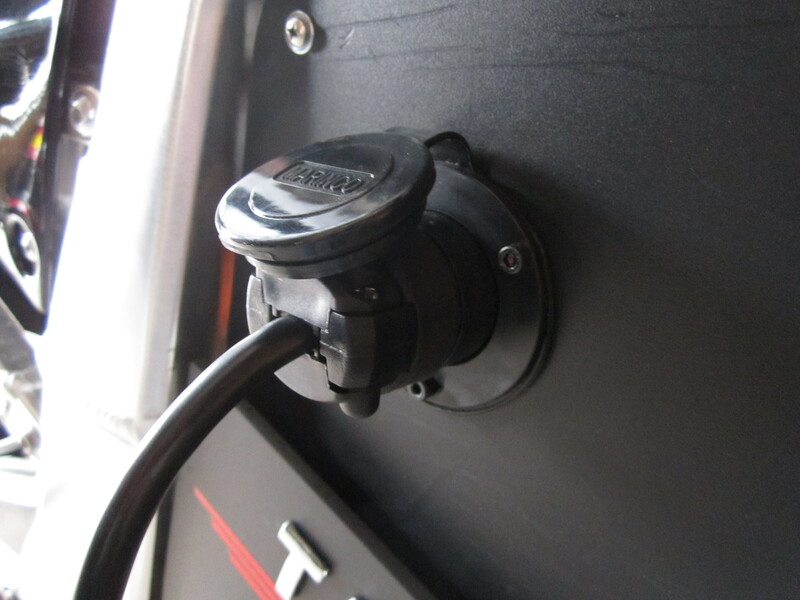 Note the front mount towards the handle bar is simply a bent piece of flat 1.25″ flat aluminum with clip on threaded inserts. It was constructed like all of my other battery frames, making a “basket” on the bottom and using the metal to support the sides, front and back up to the mounting points. I was having trouble getting good lateral support on this battery mount, so I used one large threaded rod with 2 nylon stop nuts and aluminum tubing to act as a spacer. This made for one very supportive mount pictured below. 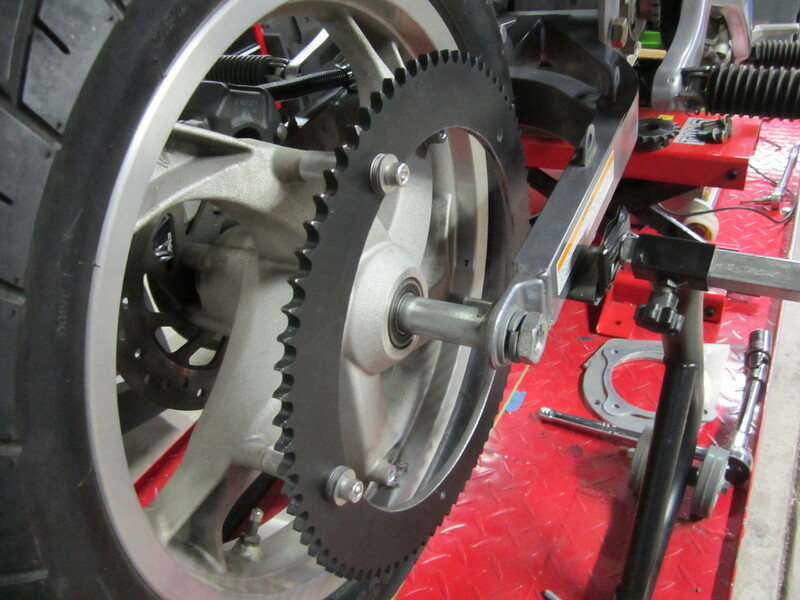 I then decided that the best option to mount the motor would adding two plates to the swing-arm mount. Using cardboard I mocked up where the motor would be sitting and made templates. 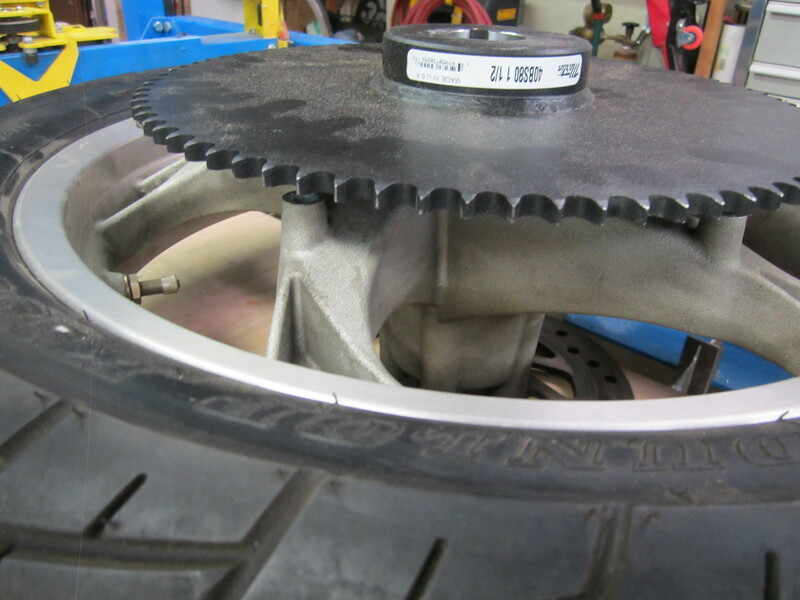 I was sure to include the chain tensioner and spring mounts (see next chapter) I then cut them out with cheap 1/4″ thick particle board to ensure all was correct. 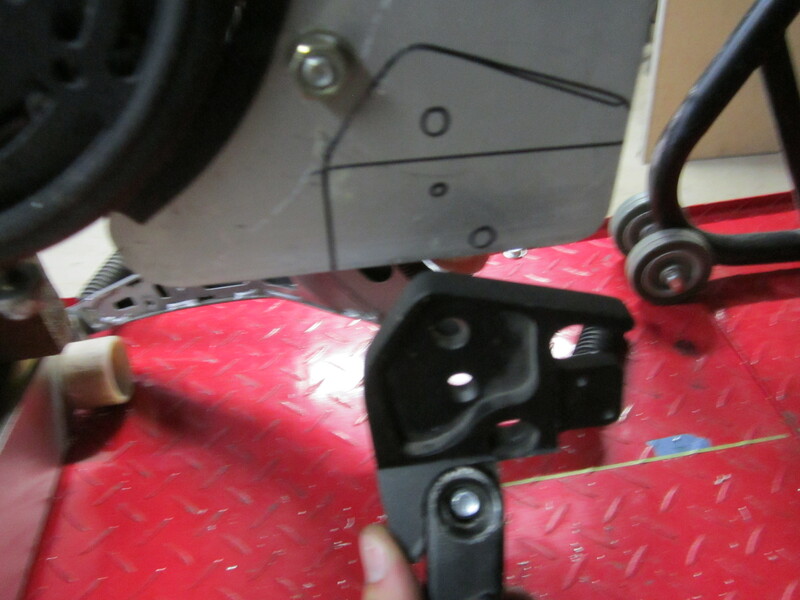 Best picture I have of the swing-arm bracket. 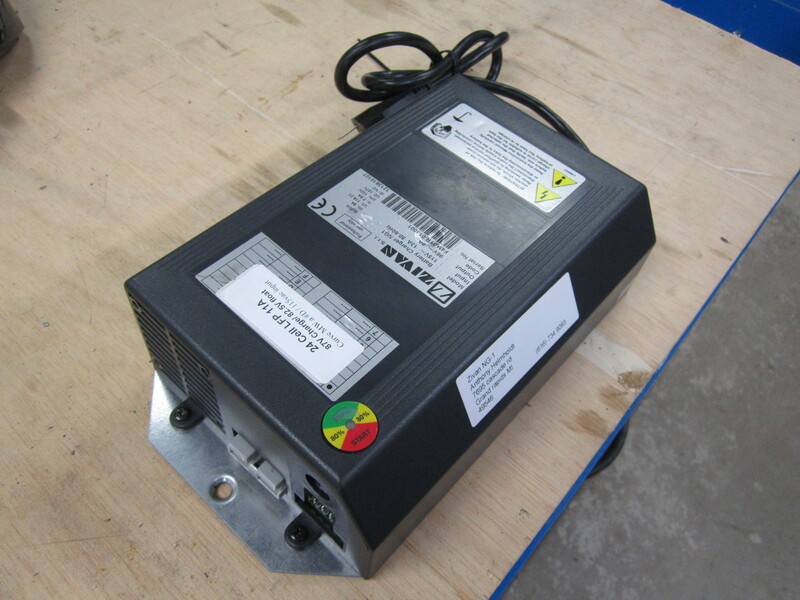 Also the ME1003 DC motor sits on a jack in position. 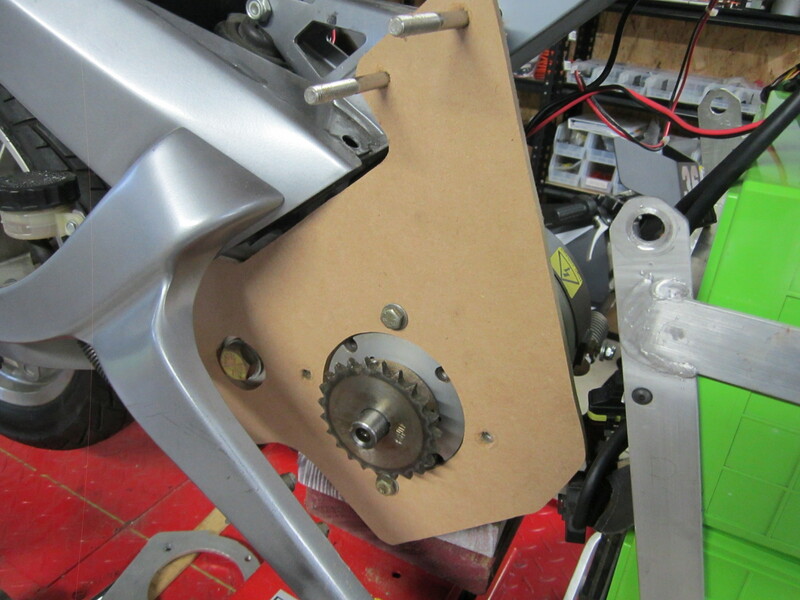 Wood motor mount installed, note how it overlaps the existing swing-arm mount. 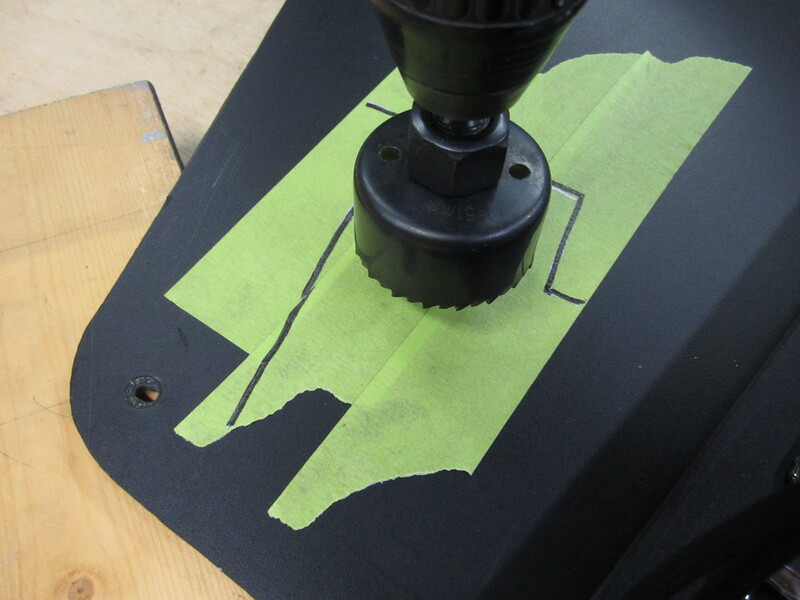 Using a jigsaw, patience, clamps, and a hole-saw I cut the mount out! 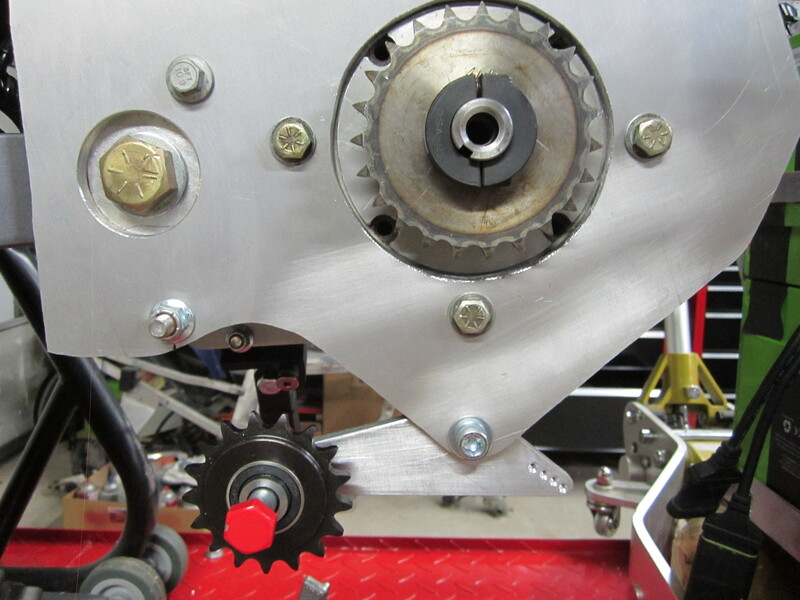 I then had to drill large 3/8″ holes through the frame and long bolts for extra stability and structure that the engine previously provided. 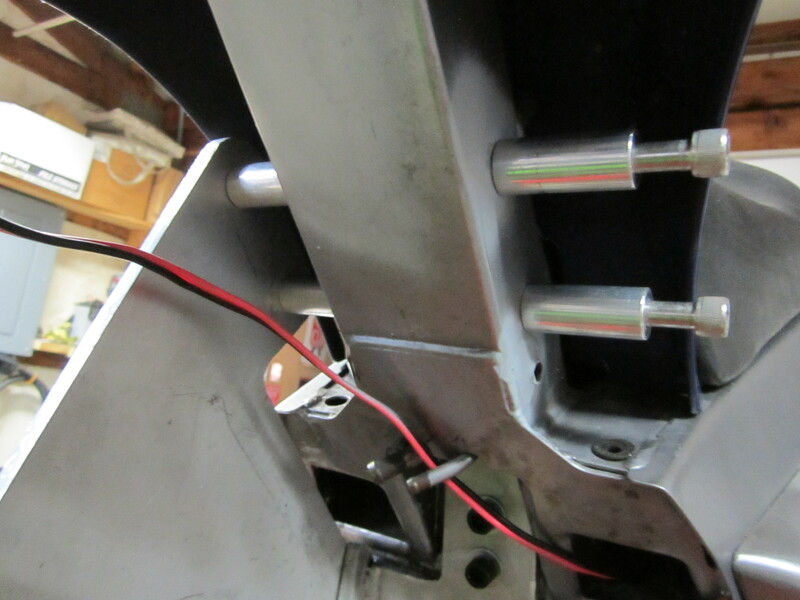 Note the 10″ long allen bolts with 2″ aluminum spacers for proper alignment of the mount. 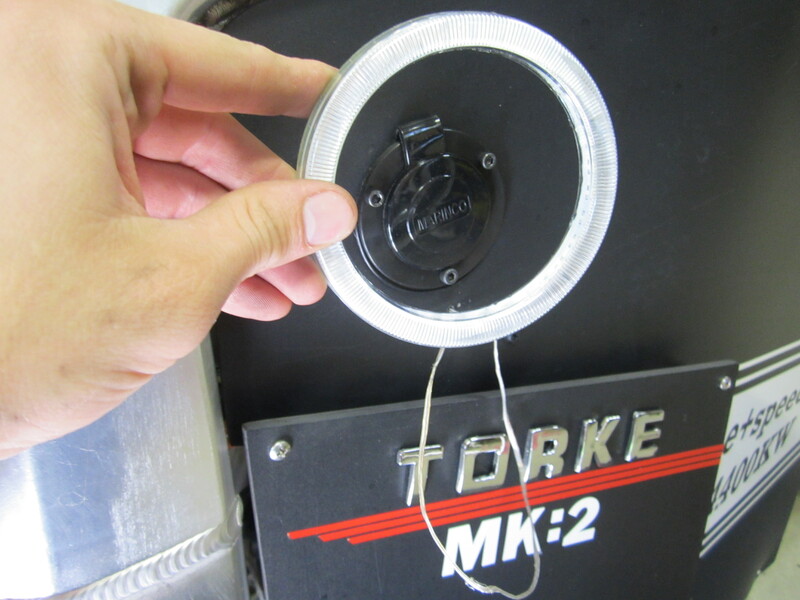 Finished and clear-coated motor mount. 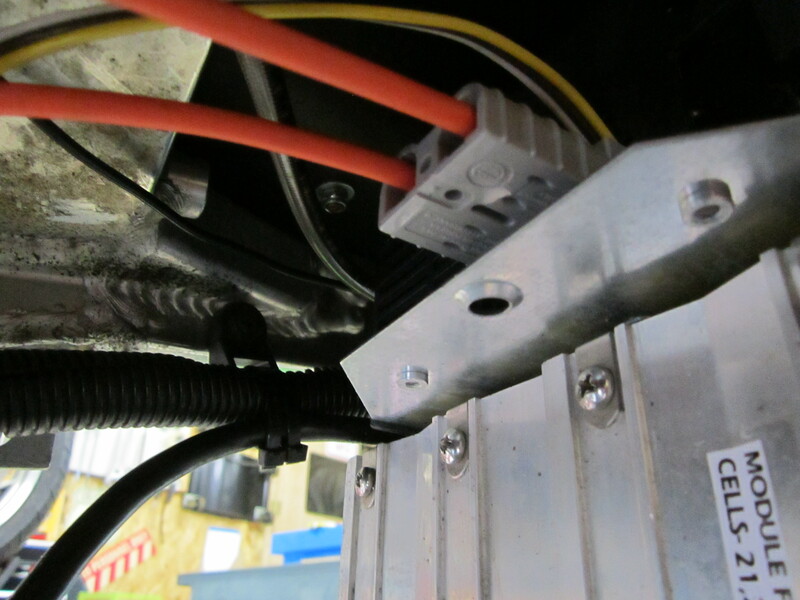 Here is the REAR motor mount. 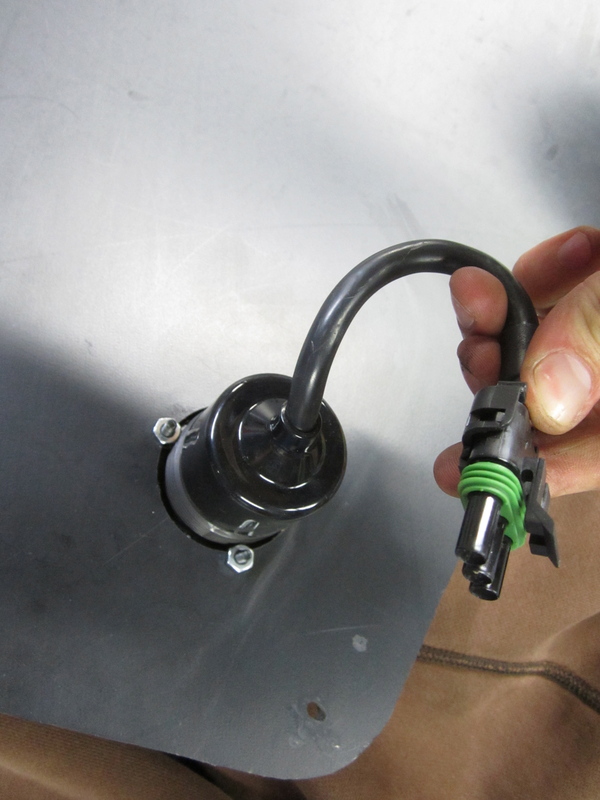 It is basically the same as the front mount but cradles the motor with a high temp rubber edge, and a high strength hose clamp to ensure it engages and seats in the mount via wrapping around a stud at the apex of the cradle. 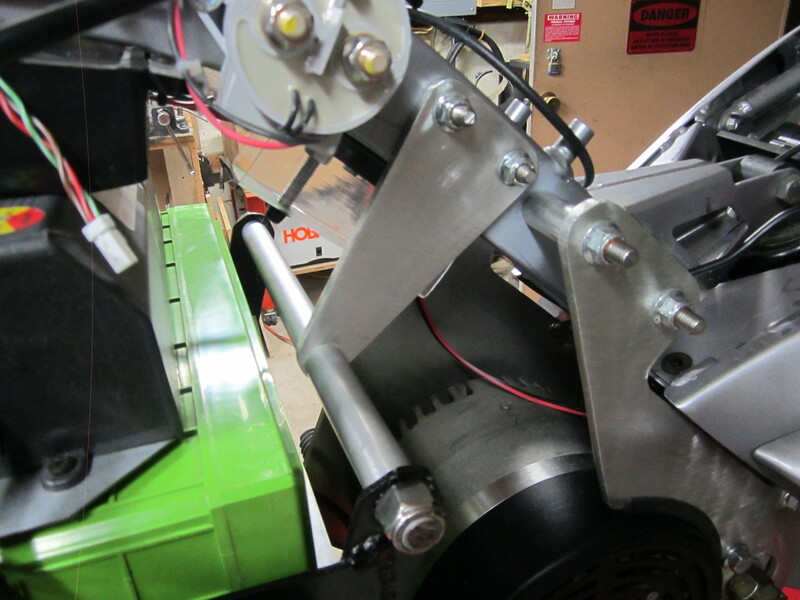 see how the mount cradles the outer permitter of the motor keeping it stable. 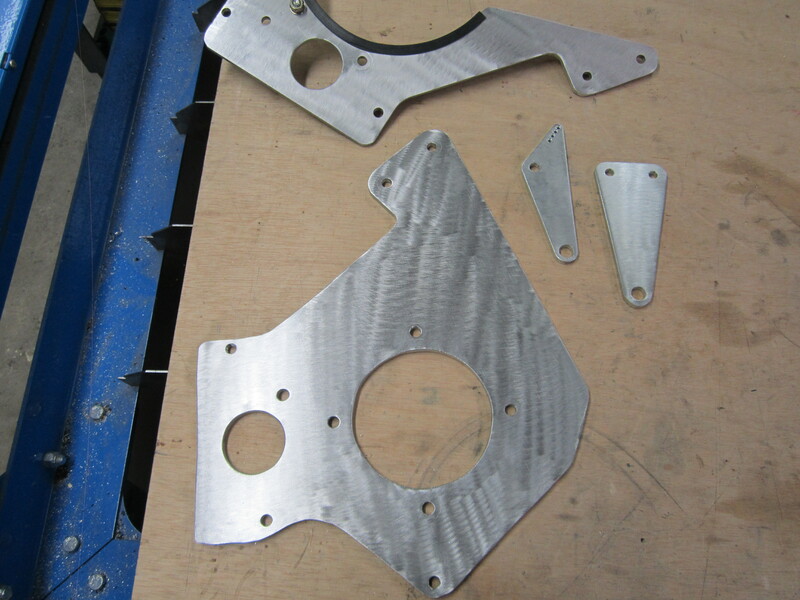 Top is the rear motor mount, bottom is the front (motor face) mount. Small triangle is chain tensioner (chapter 3) large triangle is battery mount. 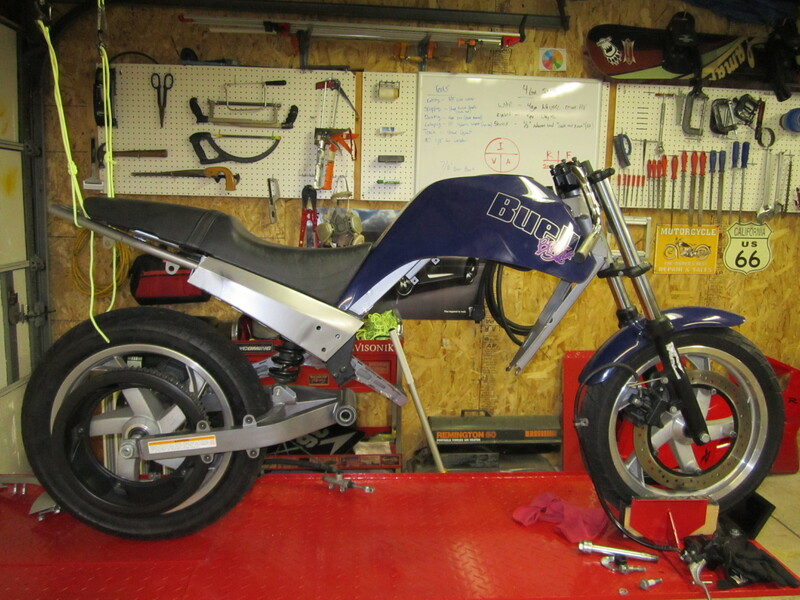 Its been a while since I’ve had time to tinker in the garage. 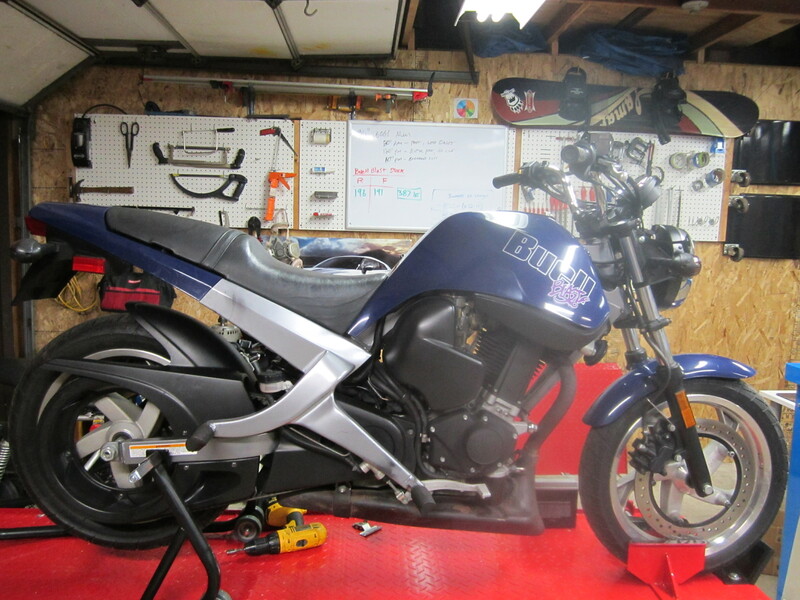 I finally got around to throwing some parts at this Buell Blast. 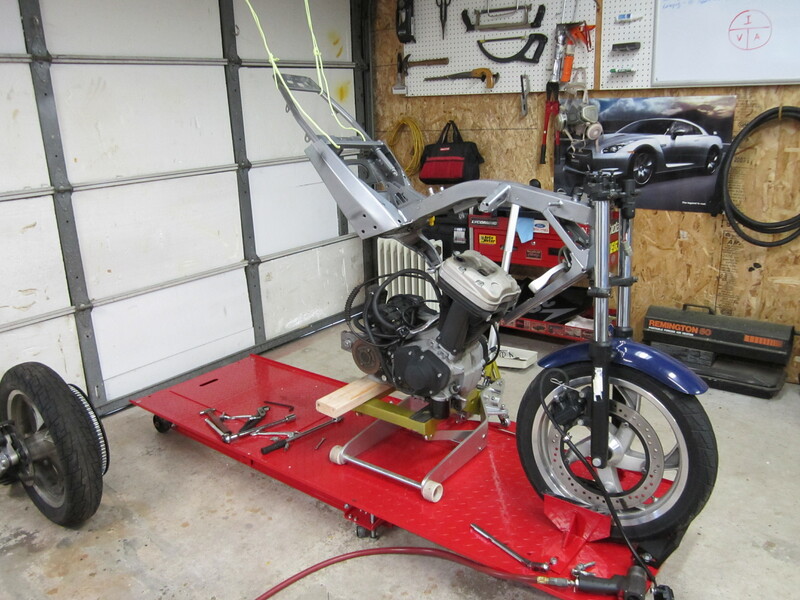 Seemingly a simple lightweight motorcycle conversion it turned into a mechanical challenge rather quickly. 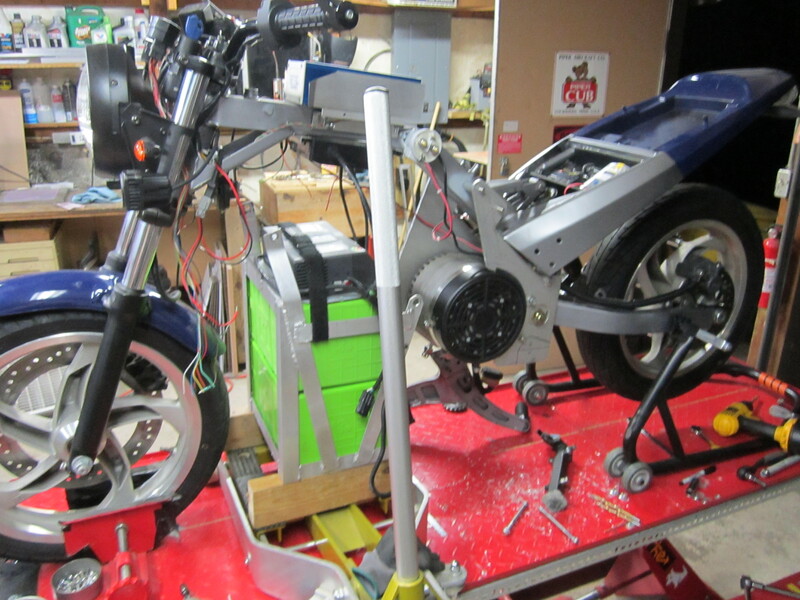 Upon disassemble of the gas bike I soon realized this wasn’t going to be easy. 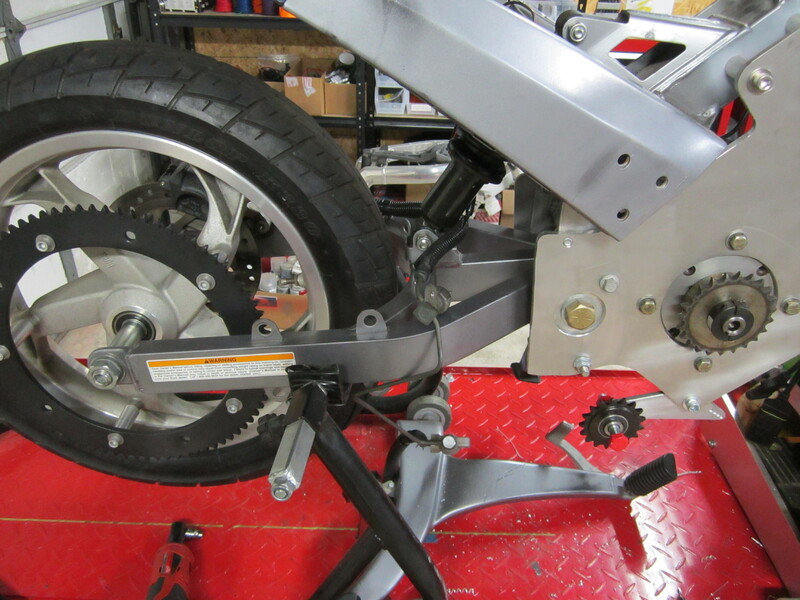 The complete rear swing arm AND kick-stand were attached to the engine block. This quickly made things challenging as the bike was basically in 2 parts. Bike in 2 pieces, this was un-planned. 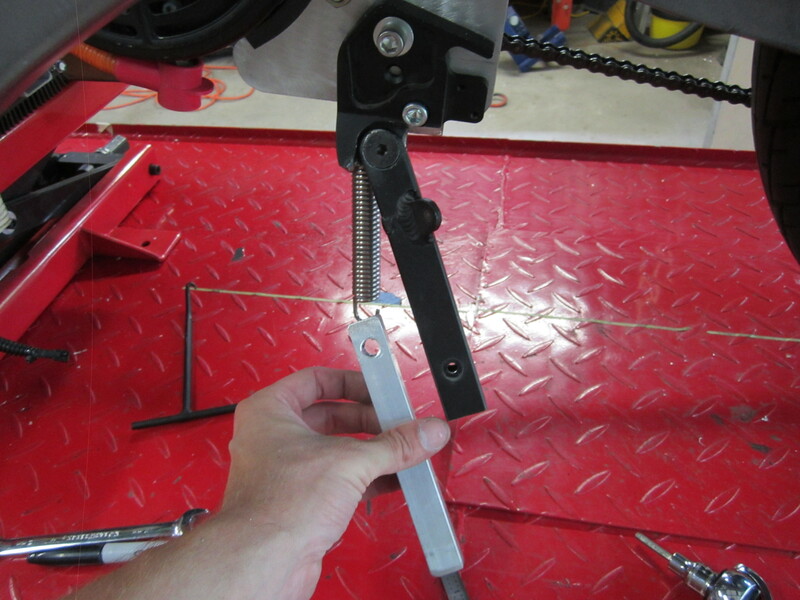 First and foremost I had to figure out a way to re-attach the rear swing arm. Using levels, lasers, and good ole’ rulers I situated it perfectly with the main frame based on previous measurements and pictures I had taken. 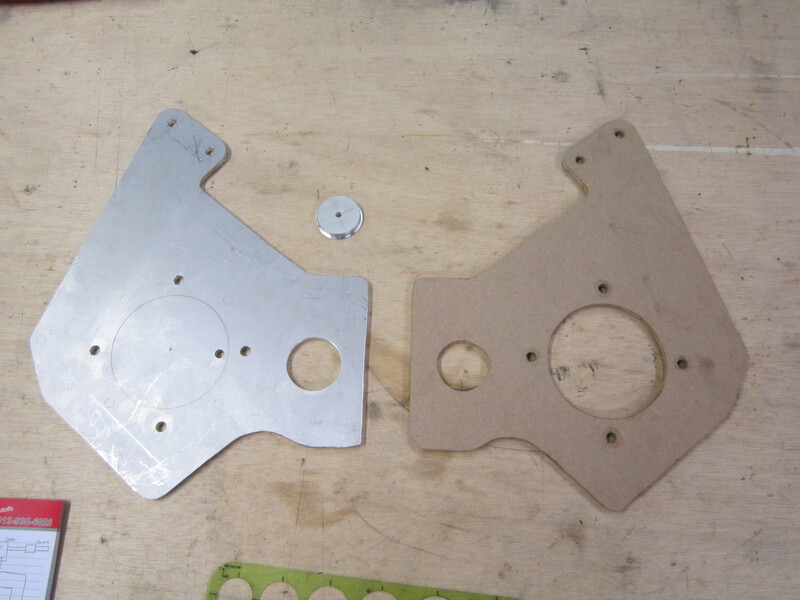 I then used cardboard and cut out templates to make a very stout bracket aluminum welded bracket. The original swing-arm bolt would NOT work as it was clamped on one end (no head or threads) I only had two holes in my bracket. 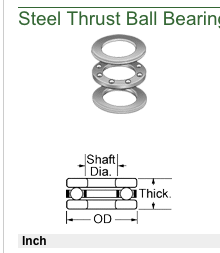 I found a very large metric bolt on McmasterCarr.com with two nuts used to lock the proper tension on this shaft. Wood jig to hold swing-arm in place for measurements. This year a friend of mine Kraig Schultz is hosting the first west Michigan fuel economy challenge. It will be held on Muskegon Earth Fair on April 27, 2013. Vehicles will be from the Muskegon area. Challengers in a 55 mile radius around Muskegon are invited to compete. 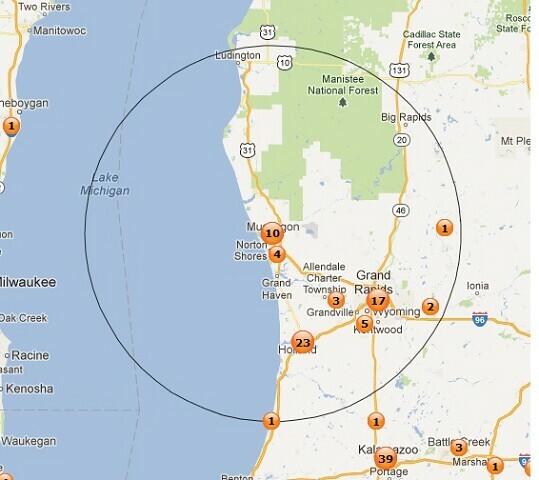 This area includes Muskegon, Whitehall, Montague, Ludington, Big Rapids, Grand Rapids, Holland, Zeeland, etc. 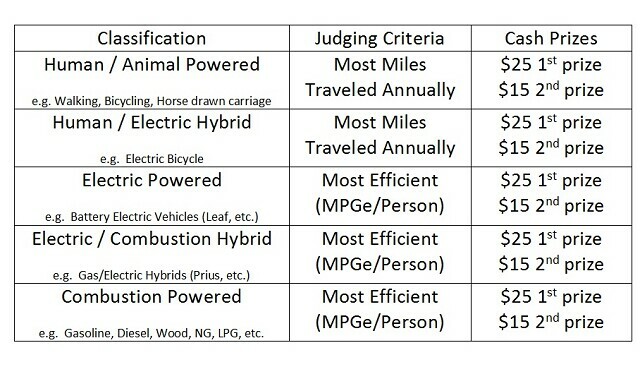 The competition is judged on either most miles traveled annually, or efficiency via MPGe. Refer to chart below. I want to make a quick post with the important factors of both of these systems, and their applications in the real world. In sence both of these power-trains are rather similar. 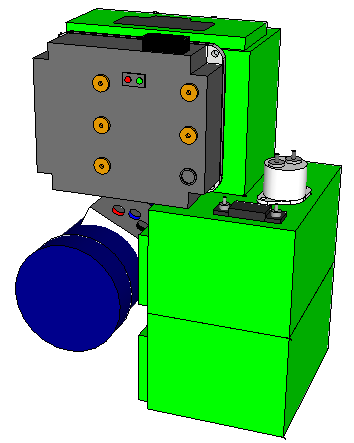 The FCEV is essentially a BEV but instead of a large battery, it uses a much smaller high voltage traction battery (sometimes no battery) with the addition of a membrane fuel cell energy converter (Proton exchange membrane) on board that mixes 2 gases, usually hydrogen and oxygen (other gasses can be used, but these are by far the most common) and creates a reaction where bonds are broken and atoms are traded to form another substance, usually water is the by-product. During the reaction of breaking these covalent atomic bonds, energy is released. We can capture most of this energy using a fuel cell device, use it on demand, or store it in a battery until needed. 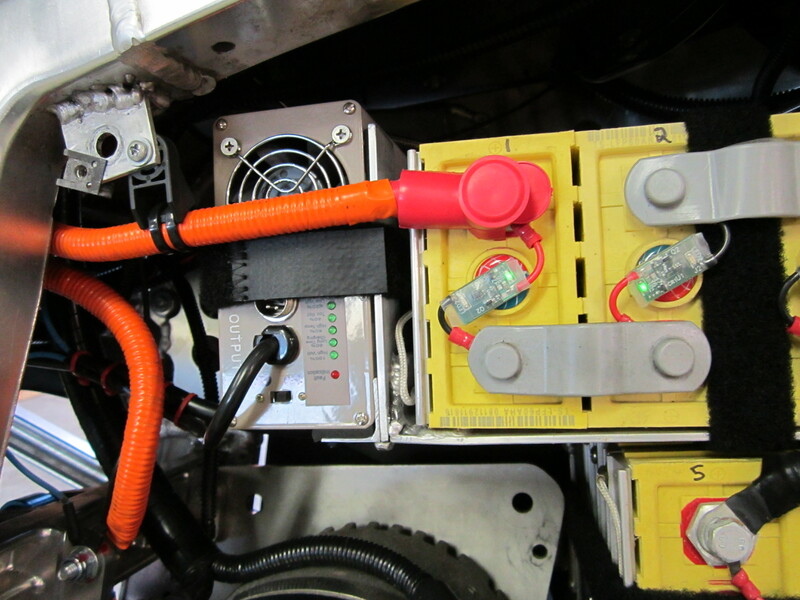 Now lets look at the in’s and outs of using hydrogen on board a vehicle as a FCEV. 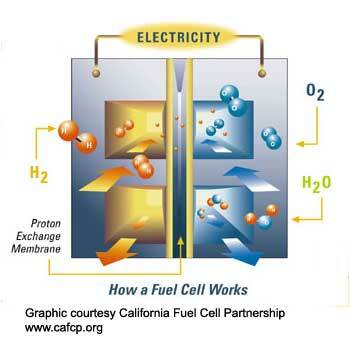 –Efficiency– Some of the best fuel cells that are commercially available are only 80% efficient. 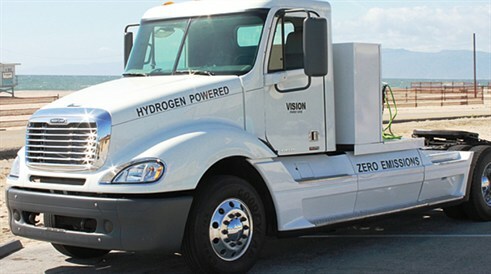 (only 80% of the hydrogen energy is actually captured) where BEV’s are usually upwards of 90% efficient with its on-board energy. 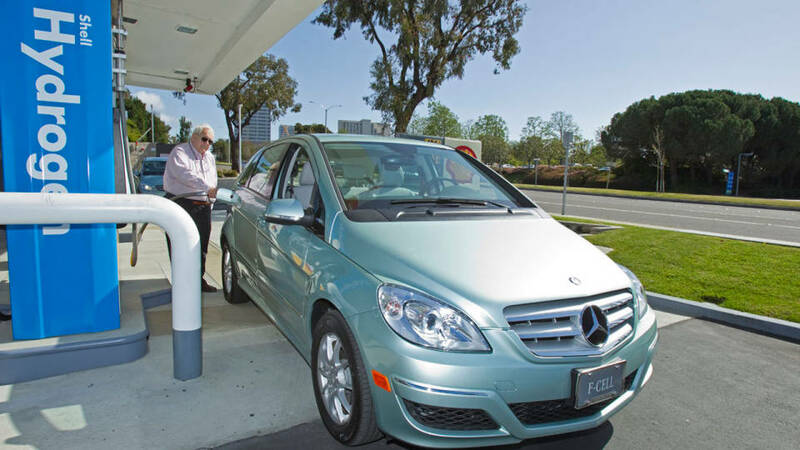 –Cost– one of the currently available FCEV’s the “Mercedes-Benz F-Cell” can be leased in only certain areas for $849/month! Full review here- http://www.roadandtrack.com/car-reviews/first-drives/2012-mercedes-benz-f-cell. Given that current BEV’s are fairly expensive, but the price has come down a lot over the past few years. Note the new lower price of the 2013 Nissan Leaf at $28,800! –Rare metals– Most current designs of fuel cells require the use of very pure platinum in its construction. 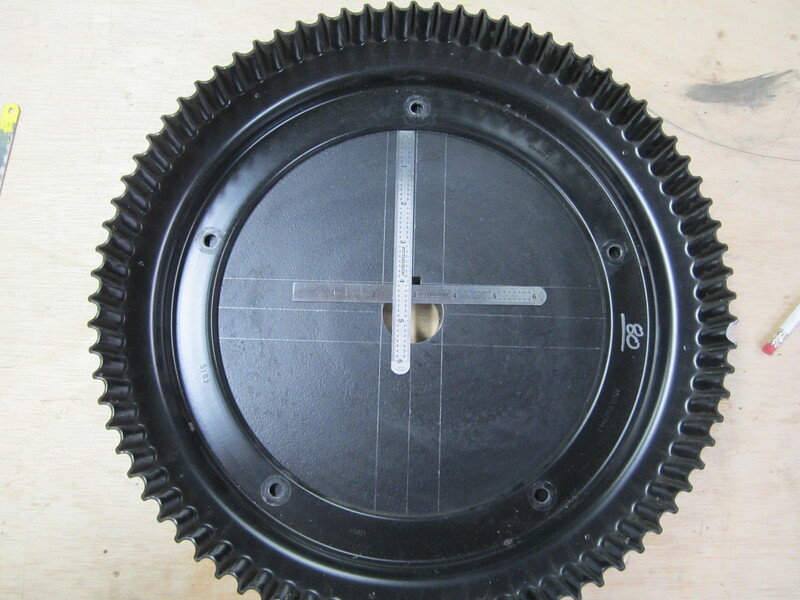 This is a very rare and expensive metal for something to be intended for wide spread adoption. Advancements in using less platinum, and shaping it differently has come a long way, but it’s still necessary. 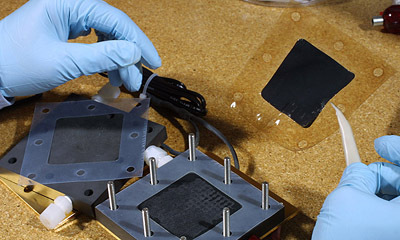 Lithium batteries require some special materials too, but luckily they are in abundant supply and getting more common due to their current demand. 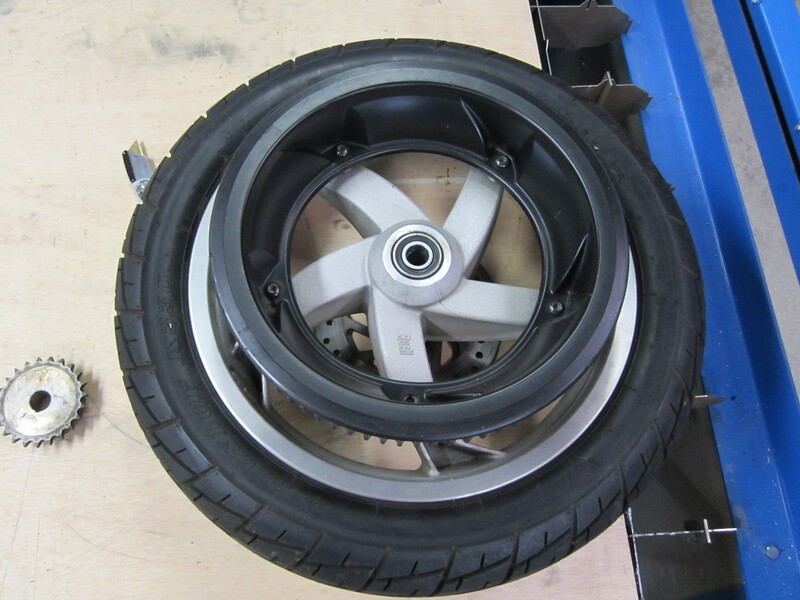 –Complication– The well-to-wheels operation of the FCEV goes something like this. 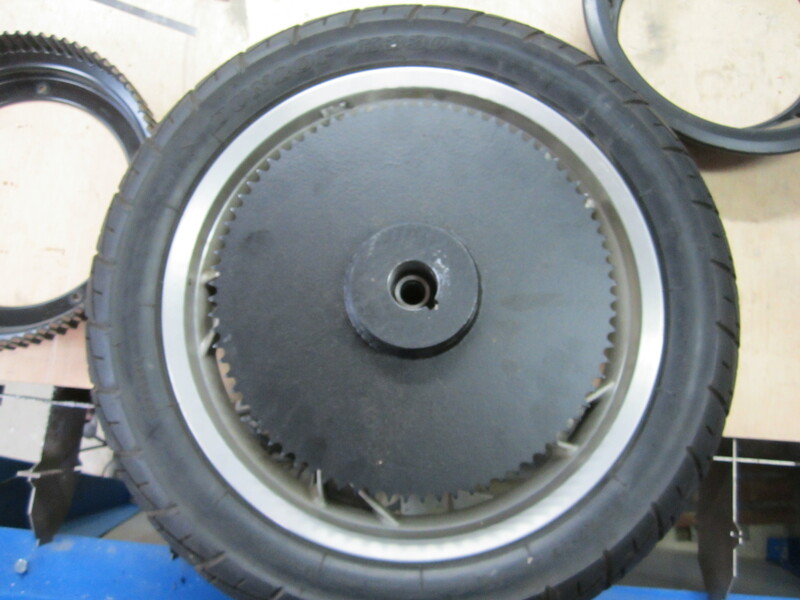 compared to a BEV’s well-to-wheels goes like this. It takes energy to perform every step listed above (>), reducing the overall efficiency. if you notice also in the FCEV number one, the cycle begins as electrical energy and ends as electrical energy. The hydrogen is just a “carrier” of energy in this method making MANY inefficiencies during the process, where as a BEV uses direct electricity during the entire process, eliminating many inefficiencies. 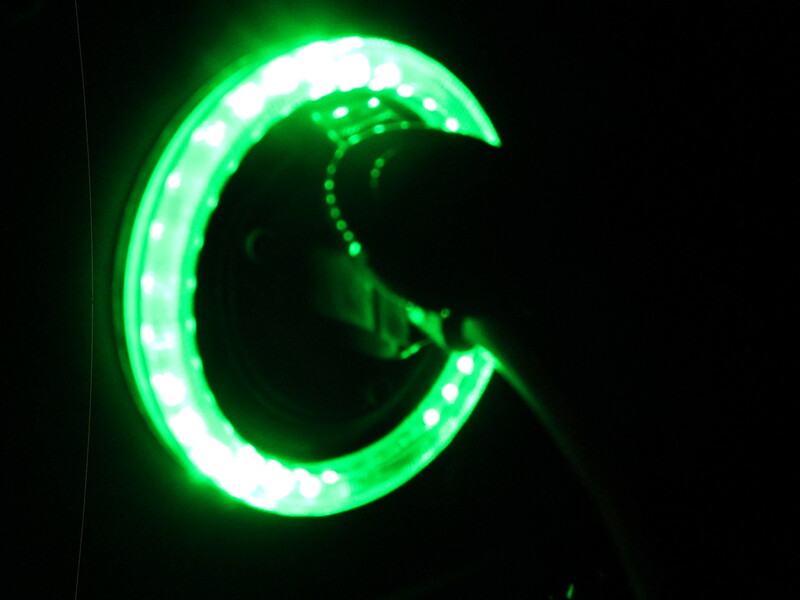 –Time of re-fueling– This is the only area where the FCEV shines, it can be re-fueled rather quickly in minutes. 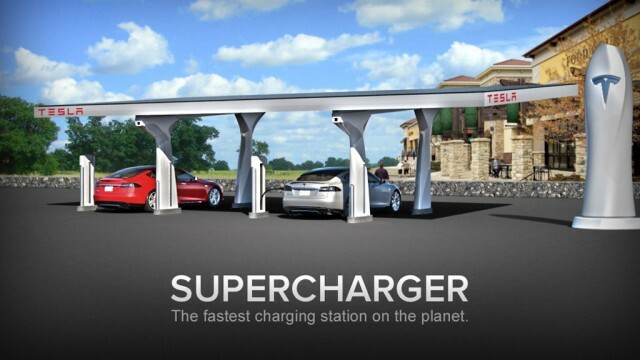 Where as the fastest BEV charger can return 150 miles in 30 minutes (Tesla supercharging station) still fast, but not as fast as the FCEV. Understand that I am not intentionally trying to dismay the use of fuel cell vehicles, I think anything that is more efficient then our current ICE engines is great. And any invention that can operate on a non fossil fuel is great! Although the FCEV has some serious infrastructure and efficiency issues currently it doesn’t mean that in the future these can be advanced and improved. These inefficiencies of FCEV’s compared to battery electric vehicles can sometimes be overlooked for the quick re-fuel time in cases like the trucking, and construction industry where downtime in unacceptable, and fossil fuel usage is currently way too high. 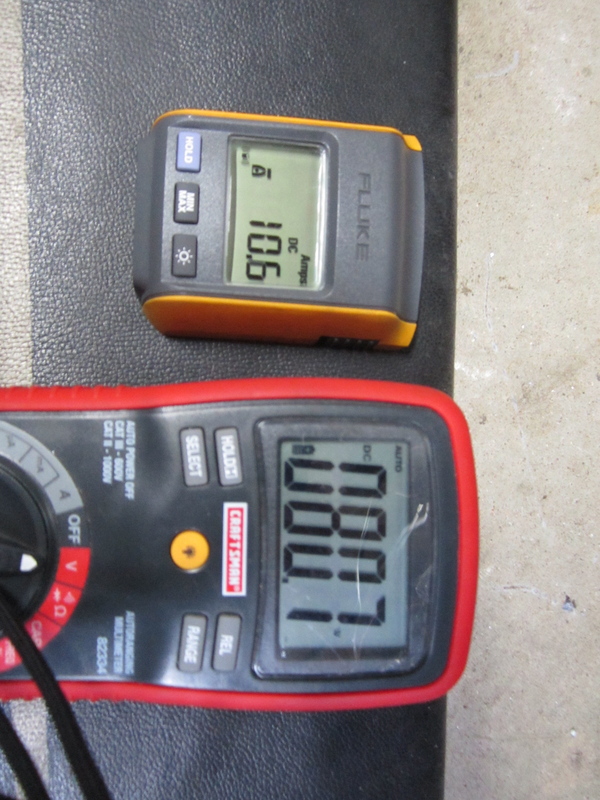 Compressed Air Power, Is It Real, or Just Hot Air? All of us are familiar with air, and most of us are famaliar with the power of compressed air. Its easy to see the potental energy in compressed air by going to any local auto shop and watching the air tools they use exert extreme energy. Compressed air is ecentally stored electrical energy, much like a battery, just in a different form. The idea of using compressed air as a vehicle energy source has always intrigued me. 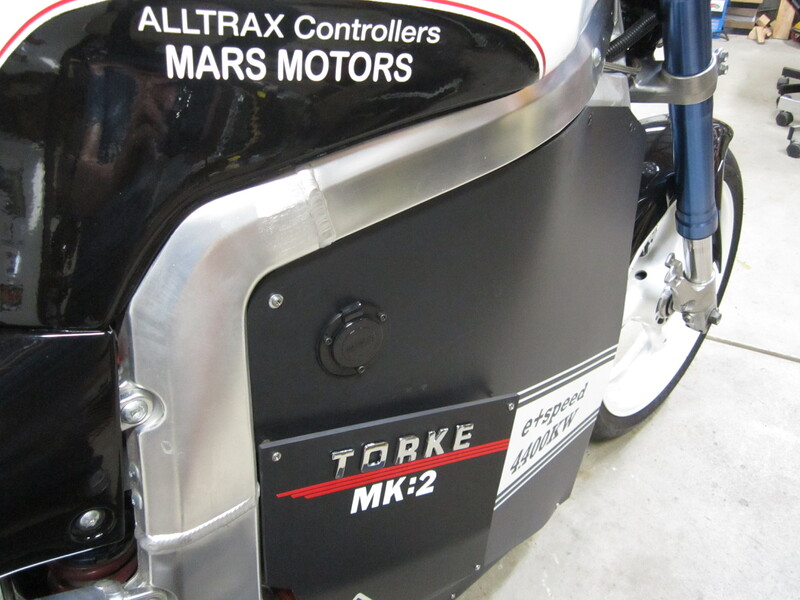 Recently a company in Australia built a working prototype of a motorcross air powered motorcycle with fairly impressive numbers! I do see a few flaws in the current idea of trying to impliment air powered vehicles. First I wouldn’t say there “easy to fill” since there’s pretty much no infrastructure, Other then scuba filling shops which will charge 10~15 dollars to refill a tank to the stated 2,900 psi, because no household or even professional shop compressor can reach that pressure. Also with current technology the tank would have to be physically removed and placed in a bath of water to keep it cool during filling. As for cost to “fill-up” at an average $12.50 (some scuba shops I called) would make the operating cost 20 cents per mile. Even a decent 250cc gasoline motorcycle can achieve about 7~12 cents per mile at $4 per gallon gas. 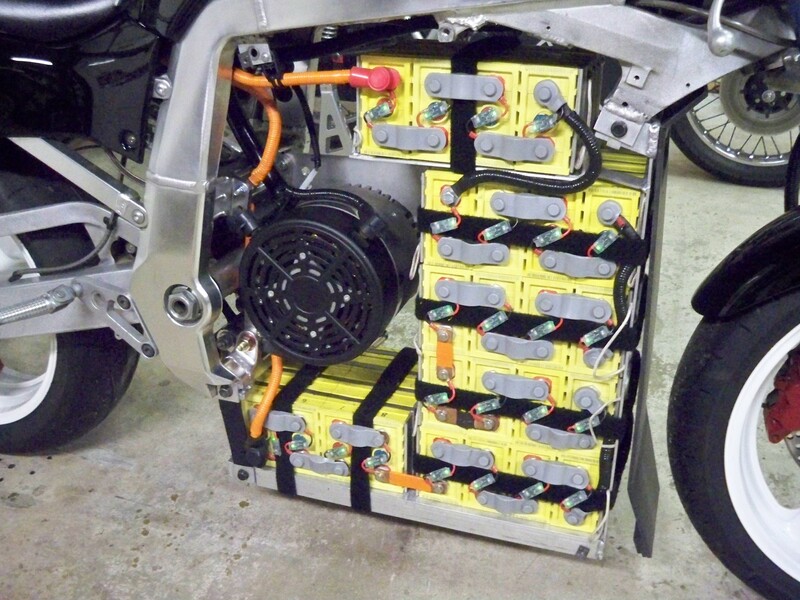 This is where EV motorcycles (and drivetrains) shine, it costs about 50 cents to fully recharge my motorcycle, including the 15% inefficiency of the charger. Condescendingly enough my motorcycle also has a 60 mile range, therefore it achieves an efficiency of .008 cents per mile! Like the hydrogen engine and fuel cell idea, it unfortunatly seriously lacks infrastructure. If someone gave you a hydrogen or air powered vehicle tomorrow, where would you fill it? But electricity is everywhere, literally every building and house has it right there to charge batteries or capacitors for your transportation. 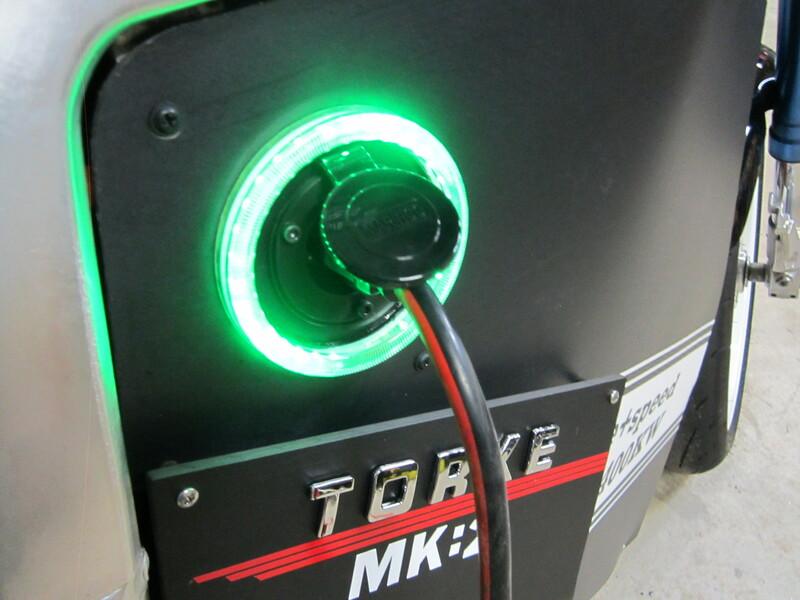 And with the rapidly expanding charge point, blink, and chademo network, high power, fast recharging will soon be available at every popular mall, theater, and restaurant (like in California already) and that’s if you require a charge! Although infrastructure for compressed air energy would be vastly easier then the others to implement since it only requires the installation of a high pressure air compressor and electrical hook-up. Where as crude oil, hydrogen, ethanol, and natural gas requires refinement, compression (sometimes), and physical transportation to stations. Using energy to transport energy, which is poor use of energy and very inefficient. 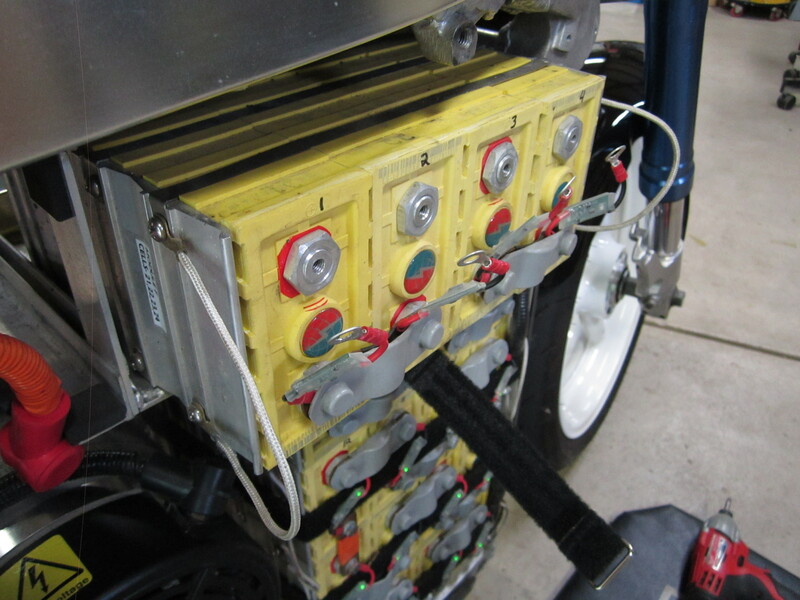 There have been some interesting ideas of mixing the EV drivetrain with an air powered generator that could be filled rapidly at stations, probably more likely to be on a car since there’s more room for that multilple energy systems. In conclusion, Currently electric vehicles have far better efficiencies, infastructure, and energy storage. 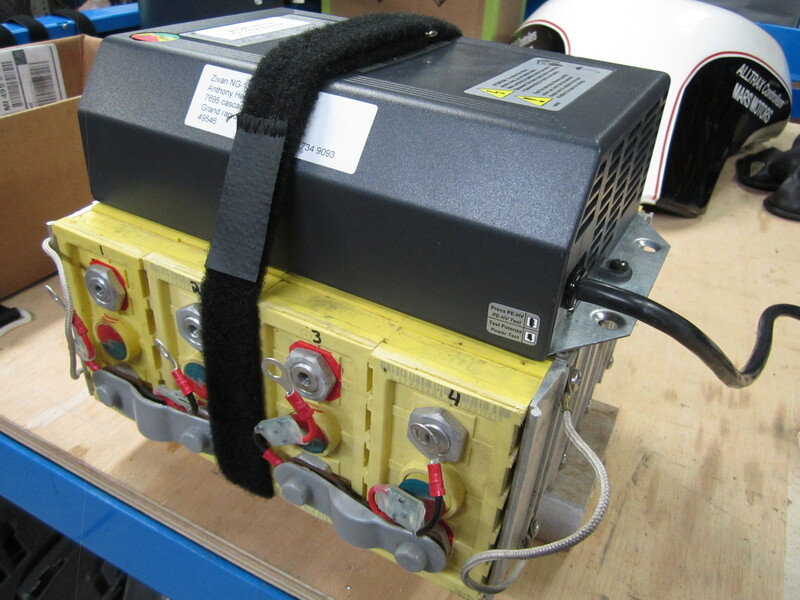 I would perfer to see the contuning integreation and development of air energy storage for vehicle power. I believe it has vast advantages over current energys derivered from crude oil becasue it of its renewable factor combined with a simpler infrastructure to construct. This is the second summer season of riding the E-Speed motorcycle, it has been through a lot more charge cycles, and conquered more miles! I started the season with 1,133 miles in April, and have finished with 2125 miles, so the total mileage of this season was 992 miles. Thus far the 60 mile range seems to remain solid, with no noticeable range degradation. 18 dollars of total electricity usage. 47.2 gallons of gas NOT burned. 944 pounds of C02 NOT emitted into our air. 20 full battery charge cycles. 0 dollars given to foreign oil companies. 1 very happy EV owner! Occasionally the motorcycle would shut off on very light bumps, I quickly diagnosed it as loose contacts internally in the switch. A simple switch replacement fixed the problem. Perhaps because I was one of the first to buy this charger, I may have received a faulty one, but never the less it failed on me and unfortunately because of the method I use to measure capacity on my motorcycle where I always reset the amp-hour used when I assume the battery has been fully charged, but in this case of charger failure I was assuming wrong, and I was left stranded about 10 miles away. This luckily will not happen again because of much better designed SOC measurement systems available now which will be implemented on the next motorcycle! 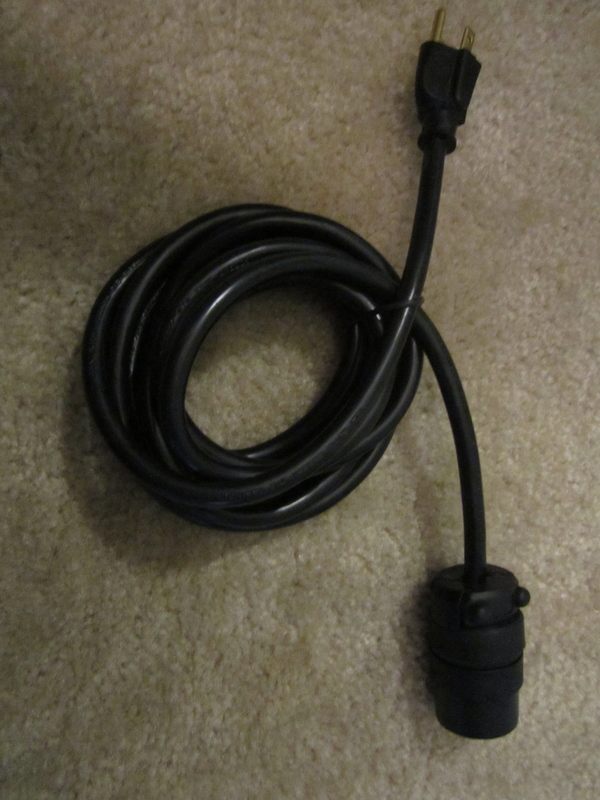 The charger has been since replaced and been operational thus far. I also had the pleasure of riding with a (cute female) passenger many times this season, I was curious how it would effect efficiency and acceleration, but surprisingly it wasnt too bad, I lost a small amount of Wh/Mile and getting on/off the motorcycle is a little tricky. But it certainly doesn’t take away the efficiency or fun factor at all! Although one thing I have learned on this motorcycle, is that its ground clearance is too low. I have scraped the front edge of the farrings on bumps and pot-holes around town. My next motorcycle will have a slightly higher ground height clearance to overcome such obstacles. Thus far the motorcycle has been extremely reliable, enough so that I consistently used it for my work commute and errands around town. 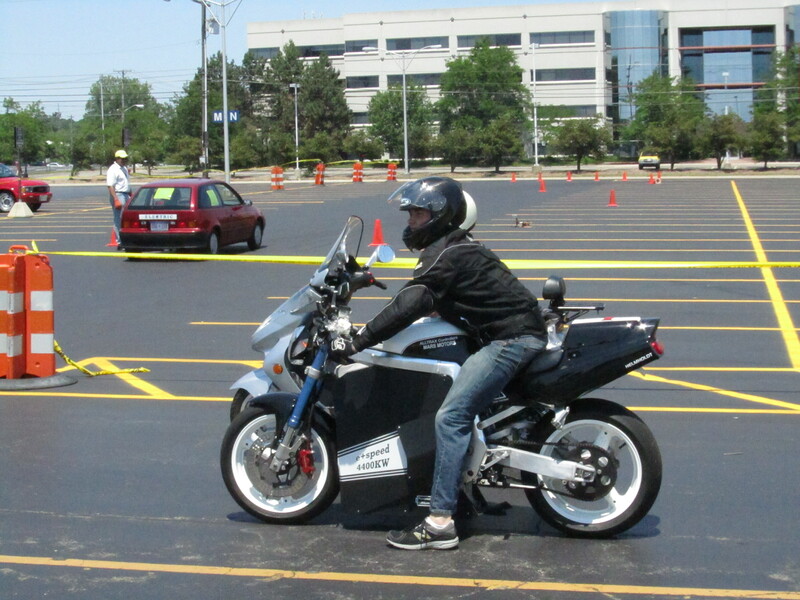 I attended two very fun and eye opening EV events to answer questions and display the bike. Hopefully we get another Indian summer like last and can ride through December!